Does mankind really know what to do when we are given the science? This version of Contact is slightly shorter than the theatrical release and differs in that instead of two attempts to use "the machine" there are three attempts so there is more going on. 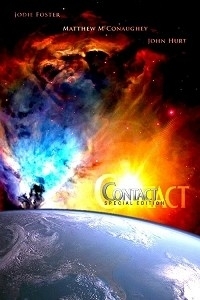 Contact: Special Edition is aimed at the fans of Contact who are interested in a slightly different spin on this intellectual tale, and question "what if?" I really enjoy the theatrical version of Contact every time I watch it. I have listened to a lot of feedback however, that it is too slow paced, and the end was unsatisfying. Personally, I do not agree, but have come up with an idea to make a slightly different version of how the events play out in Contact. Available in 1080p MP4 H.264 with 5.1 Surround in AC3 codec. Almost all televisions and surround sound amplifiers support 5.1 AC3. If you intend to watch this on PC make sure you have an AC3 Filter/driver installed. 1. The scientists rush into using "the machine"
The journey into space has been edited, and the ending has also been trimmed to make it more satisfying.